Upon receiving the request, our managers will prepare a detailed quotation. This form is a Microsoft Excel document with embedded macros to facilitate the work on it. Therefore, if you will be prompted about macros confirmation, please choose to open the document with macros enabled. 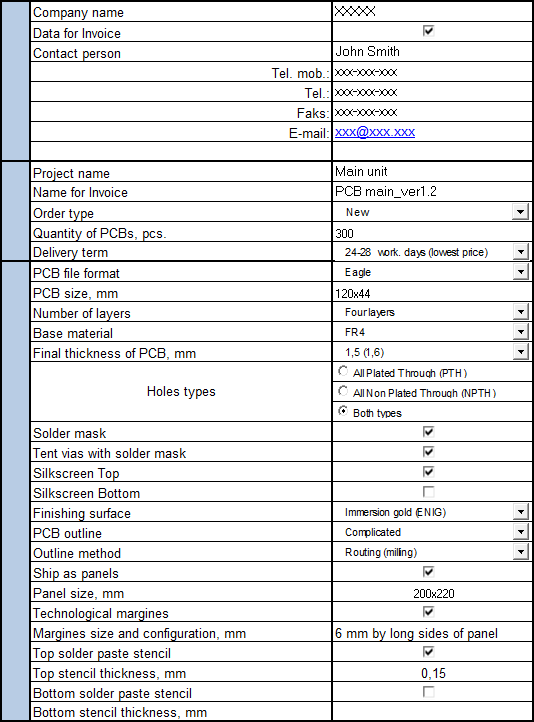 To properly manufacture the PCB we will require both PCB files and filled in order form. Please note that PCB files may not contain all required information such as board thickness, surface finishing, layer stackup or else. That is why we recommend to send us order form with more PCB parameters. If you are going to place a repeat order (i.e. order that we have a setup made before) you may just sent us the PCB order form without any project files. Just mind please to indicate the order type as Repeat and specify the desired quantity of PCBs to produce. After sending the order by email it is recommended to call our office (see Contacts) to make sure the email has been received. Sometimes it happens for some reasons (for instance antispam filters on server side) that emails do not reach the addressees. After receiving the PCB order our engineers will make the preliminary check of the project data and then will start the preparation for production. If there will be some technical suggestions at these stages, we will contact you to discuss the details. We always perform 100% input data control and design rules check to avoid the potential problems and to improve the quality of final product. Upon completion of the pre-production procedures, we will inform you about expected delivery date.